The only carbon you'll see around here is in our carbon dating. Holy Whitewalls ‘n All! Here is update on Barry M’s 1960s Hercules 10-Speed posted last year. Nice Work Barry! 1960’s, year can’t be determined exactly. no model name from what I can tell. Here’s my Hercules again, only now it has been returned to original, as much as possible. 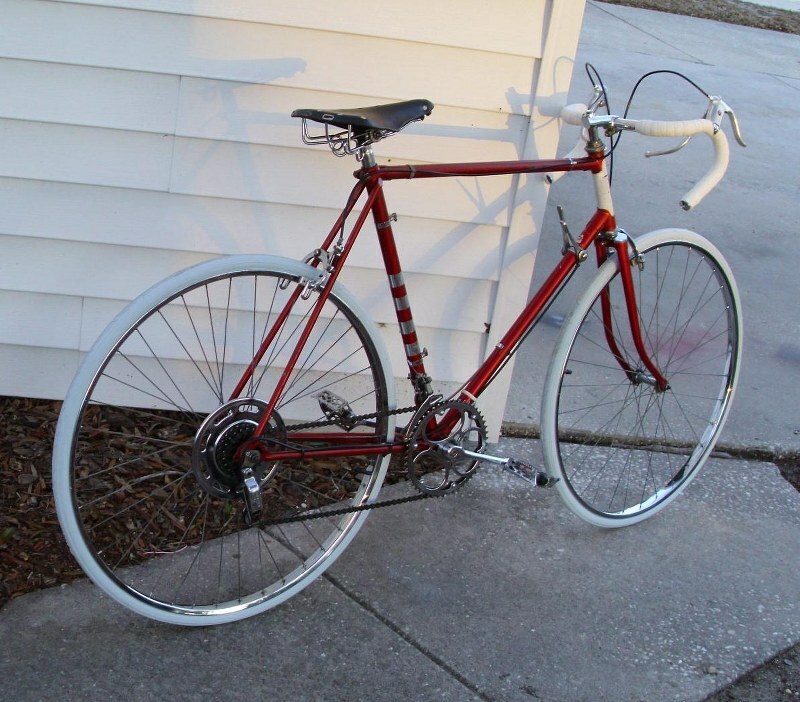 I left the original paint alone, just cleaned it up, along with the Sturmey Archer wheels. The tires, seat, handlebar tape, and cables aren’t original, everything else is. 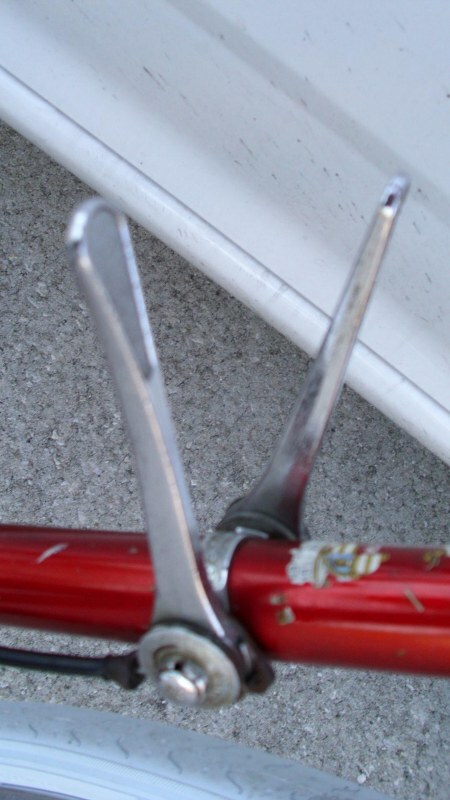 Everything metal is steel except for the original brake levers. I put the drop bars back on and added white tires. 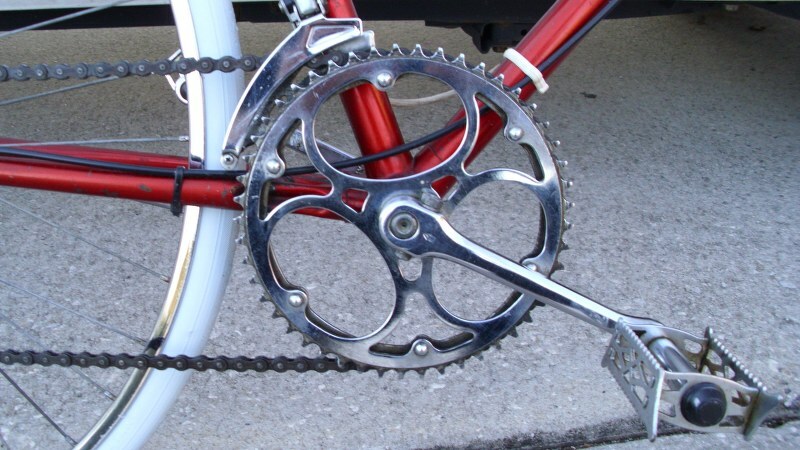 The pedals don’t use bearings, I have never seen that before. There is no slop in any of the bearings on this bike, it was ridden many miles, as can be seen from the paint, but mechanically it is sound. Very nice, Barry! Looks great! Nice bike. I had a Dunelt road bike a while ago. It had a short wheelbase and a nice agile ride. You made some great choices there. The bike looks fantastic! I’m not really a huge fan of white saddles, but this bike seems to be crying out for one. Nice job. Great to keep those cottered cranks on the road! Good, point, Mark: a white saddle would ‘complete’ the overall effect, but I can also understand how difficult it would be deciding to remove a vintage saddle from an OTS! That being stated, if it had white cables, for instance, it could flip from tasteful to gaudy. I’ve not really been a huge fan of white tires, unless they’re used to give an authentic appearance to a vintage bike from the early days of cycling, but I have to admit, there’s a desirable ‘high visibility’ feature! Anyway, I think Barry did a great job, and nearly anyone should enjoy it! I have an old Ross red and whiite striped seat that would compliment both the red and the white on your bike! Judging from the background, it looks like you’ve got a whole lot more than a red/white saddle, there, C.! Yeah! I’ve been “collecting” bikes for awhile now. These are my multi-speeds. There is a shed with Chicago Schwinns, Columbias, Raleighs,etc. 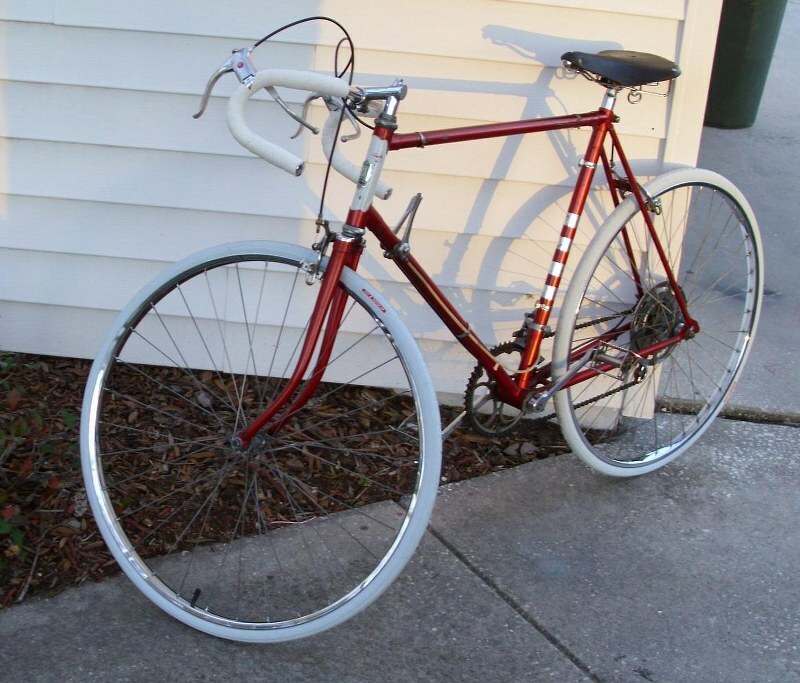 I’m in a position to acquire old unused bikes. Every day is Christmas! Thought that I used low “pixels” so that the pictures could be aseen! I’ll try again soon. I cannot find the secret to add picures to my posts. I took pictures of the red and White Ross seat that I mentioned the other day for Barry M’s Hercules. No way to copy and paste. I’ll send it to the web site address and see what happens. Bill, there is not secret to posting pics in you comments. They just need to be hosted. (imgur.com, photobucket.com, flickr.com all work well.) You can you use the code they usually provide, paste it to your comment, and it should display. immaculate… this bike’s even older than me… good job..
That’s looking really nice. I was considering putting white tires on green ’74 Motobecane GT–now I’m convinced. 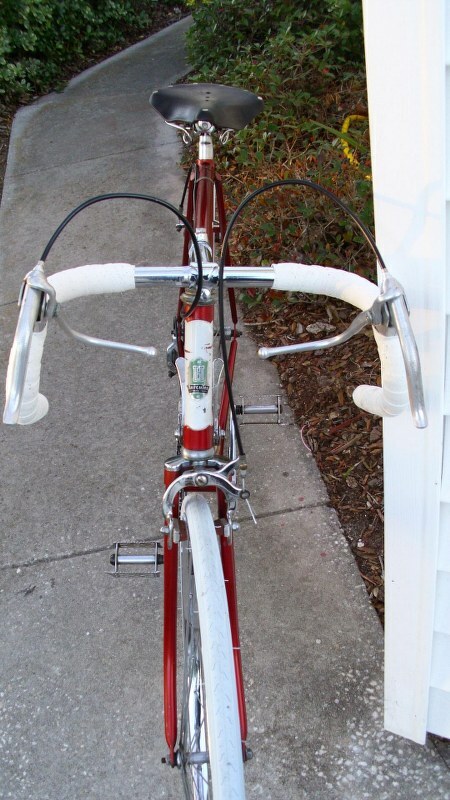 It’s probably early 70s, because of the auxiliary brake levers and the spoke protector, both items that were inspired by Schwinn and emulated by many other makers who were providing bikes to the American market during the early years of the bike boom. 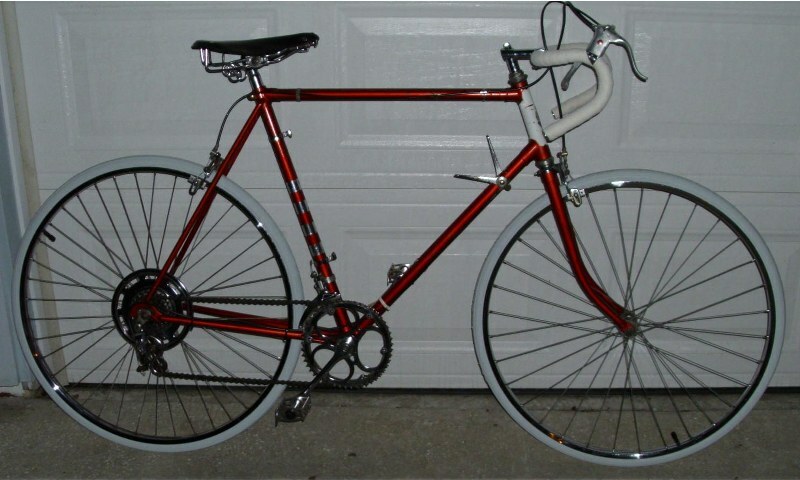 That said, it’s an old-fashioned bike that probably was originally designed in the mid-60s. Beautiful original condition, and Hercules was a quality brand. 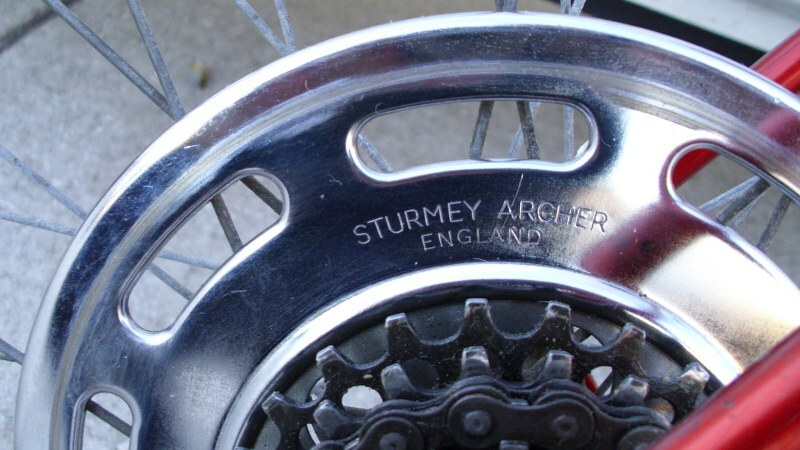 Maybe it’s a 72, the first serial number digit is a 2, another old Hercules with the same chainwheels and gears was thought to be a 69. it’s number began with an 8, maybe 68. Just a guess. Anyway, it rides great.